Even after decades of trying to convince girls and women that they should do everything boys and men do, somehow there is not a 1:1 relationship with activities. Hmmmm, maybe there really is an innate difference between males and females. Well, since gals and women couldn't be convinced to do all the guy things, society is now trying to get guys to do gal things. Try as they might, though, little Johnnie still doesn't care too much about playing with doll babies. I suppose that old adage about being able to lead a horse to water but not being able to make him drink it applies to humans as well. Never fear, though, the busybodies will keep meddling with nature until they succeeds in perverting everything. Mrs. Dottie Conover has a better approach. Sunday is coming up. Weather is sunny and calm, a perfect day for the big model contest. But your wife wants to go to a family reunion at the lake. The atmosphere at home is definitely cloudy and cool. What to do? Wait, maybe I can help you. I am a modeler's wife and feel very lucky to be one. I wouldn't trade places with any woman even if she were a glamorous movie star knee-deep in money and men. We are a family of three, the third member being our little girl, Susan, aged nine. 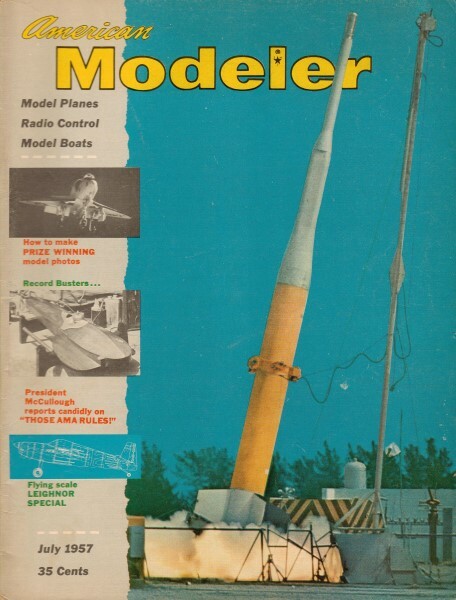 We all build and fly model airplanes. We always have one plane in the building stage; we test fly every chance. When we want a change of pace, we sport fly with a group of friends. We go to nearly every contest within a three hundred mile radius whether we can afford it or not. We talk shop all the time at home. We think flying airplane models is the most! Sounds like heaven? It is for us and it can be for you. This is no overnight miracle I offer you but if you're willing, I can show you the way. Right now your wife or girl friend doesn't like airplanes, has no interest at all in them. Now here comes the hard part. Stop and think. The fault may be yours. Here you both are fighting for your rights, neither getting anywhere. You like to fly, she likes to dance. Therefore a compromise is due. Tell her if she'll go flying with you, you'll take her out for a big evening. Now when you get her on the flying field don't just let her stand around wishing the day would get over. Ask her to help you carry the planes, but don't make her carry the tool box. Here I talk from experience! Have her time motor runs. After she's gone to a contest or two and has seen how exciting it can become, she will be ready to do a little flying of her own. Choose an old but easy-to-fly model. If you fly U-control this is easy, but if it's free-flight and you have a tow-line glider, I would suggest that. Motors can come later. Also don't forget that evening out! Never, never do anything to discourage her. Here are a few helpful hints along that line. When she starts meeting your friends, introduce her proudly. Pop a button, smile, anything to let her know you are glad she's showing an interest. When she does a good job of sport flying, tell her so, overlook the bad. To learn takes time and you can't afford to be impatient. Also don't expect her to want to fly all day. Arrange your own flying time for longer periods. Later invite friends to go along with her on a flying picnic and stay all day. See, it gets better all the time! She now wants to contest fly. She may catch "Contest Fever" the first time, but it will probably be more gradual. She can be a great help to you as driver, chaser, spotter, and launcher. Keep her so busy doing useful things that she has no chance to become bored! Also don't forget an occasional night out, she still likes such things, just as you like flying. To contest fly she must build her own models. If she wants you to build one for her or loan her an old one, don't do it. Don't let her tell you that no one will know because someone will - herself. She will miss the satisfaction of seeing an airplane she built, win. Besides it just isn't honest and people will ask out of curiosity if she built it, or her husband or boy friend. Her first competition plane should be in the class that is easiest for her to handle. She will need a lot of advice from you! Let her do the building but help her when it comes to bending wire for the landing gear, installing the timer and fuel system, etc. Make sure she covers it with an attractive color paper and applies a good finish. Then even if she doesn't like to build she will be so happy with the finished model the next one will not seem so hard. Next step of course is adjusting the model. Don't under any circumstances let her fly in a contest with a half-tested ship. Have her test fly that model until she has the feel of it and it performs consistently. You want to have her in the best position possible to win. because when she gets her hands on her first trophy you've converted her! She'll now be asking when the next contest is coming up and whether it's Pittsburg or Peoria she'll be raring to go. 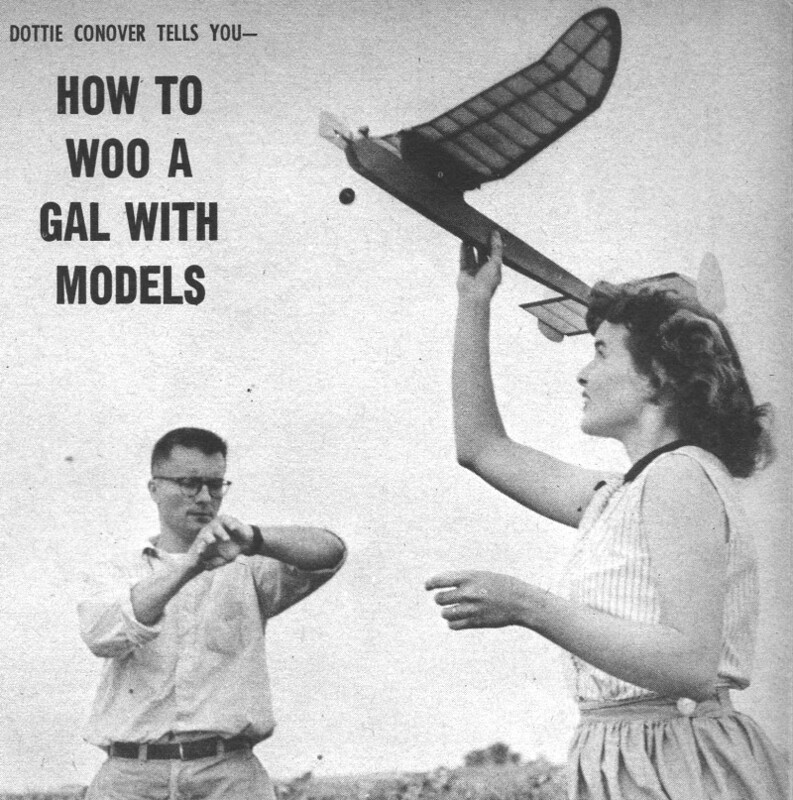 There is one very important point you must remember: model airplanes are not the usual field for women; the gals have to have help in getting interested. Any children that might be involved can be introduced to models in the same way. I'm thinking more of young girls when I say this, boys usually are no problem. Make it a family affair and your flying time will be unlimited. Vacations can take in the Nationals with everyone satisfied. No longer can you consider models the only thing in the world. You'll never get any woman to believe that. An occasional movie, dinner out and such like are in order. You will find that the more she goes modeling the more she will want to fly and the farther apart these other "extras" become. The basis of any successful relationship is give and take. I say you can be a happy modeler though married. My own personal motto here is, "Don't fight 'em, join 'em!"